My friend Phil is waiting by his mailbox for a board game that’s made in China. No, the game is nothing like “Monopoly.” It’s called “Resident Evil 2,” and is based on a zombie movie starring the lovely and talented Milla Jovovich. And the fact that it is not in my friend Phil’s waiting hand has dire implications for the U.S. economy. Phil has been expecting this game for months, since he backed it through Kickstarter. Kickstarter is an incubator for all sorts of ideas, including board games. The game was made at a Chinese factory and shipped across the Pacific. But it’s stuck at the port because the government shutdown is SNAFU-ing cargo inspection. Bad news for Phil, eh? But it’s just a board game. Now, imagine all the U.S. businesses that are waiting, waiting, waiting for their shipments to clear customs. Shipments that are in limbo due to the shutdown. 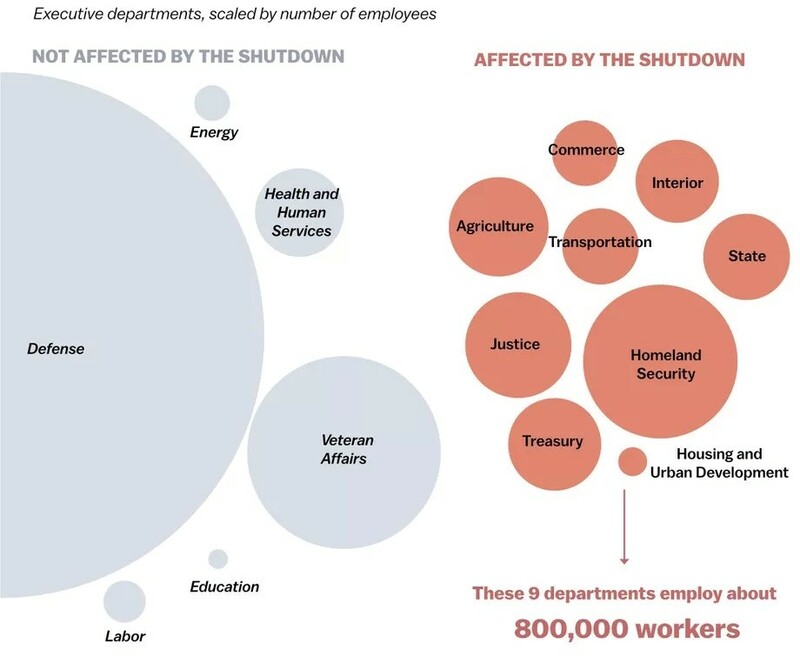 In fact, there are nine U.S. umbrella agencies that are experiencing some level of shutdown pain. Under the Homeland Security umbrella is U.S. Customs and Border Protection (CBP). Of an estimated 60,000 personnel at CBP, 90% were deemed essential and have been working since Department of Homeland Security funding lapsed on Dec. 2. Well, 90% isn’t so bad. I mean, it shouldn’t hold shipments up too much, right? ALL these agencies have import monitoring or import documentation processing operations. And they are all affected by the shutdown. These agencies have “release and hold” authority over shipments independent of CBP. And as these activities are understaffed, delayed or plain ol’ shut down, they trigger cargo processing delays. Sure, many government staffers will be ordered to work without pay. How eager do you think they’ll be? Do you think they’ll be happy? Or might they slow down … or call in sick? Small-business loans — those requiring government approval — are deemed non-essential during the shutdown. For that matter, people relying on USDA-backed mortgages can’t close on their homes. Same goes for Initial Public Offerings. The shutdown is the longest in history at 32 days and counting. It has impacted one-quarter of the government. 420,000 federal employees are working without pay; another 380,000 are furloughed. Many of these people live paycheck to paycheck. Now, they’re worried about feeding their families and paying the rent. That has an economic impact, too. President Trump has refused to sign any funding bill that does not include $5.7 billion for border security projects, including additional and replacement barriers between the U.S. and Mexico. The Democrats aren’t biting. He offered a deal that included a reprieve for some immigrants. The Democrats aren’t biting on that, either. They feel if they give in on the wall, President Trump will shut down the government every time he wants something. But President Trump is undeterred. He’s warned this shutdown could last “months or years” if he doesn’t get his way. This reminds me of that old proverb that starts, “For want of a nail, a shoe was lost, for want of a shoe, a horse was lost” … and goes all the way to a kingdom being lost. Estimates of GDP growth in this quarter are being ratcheted down. 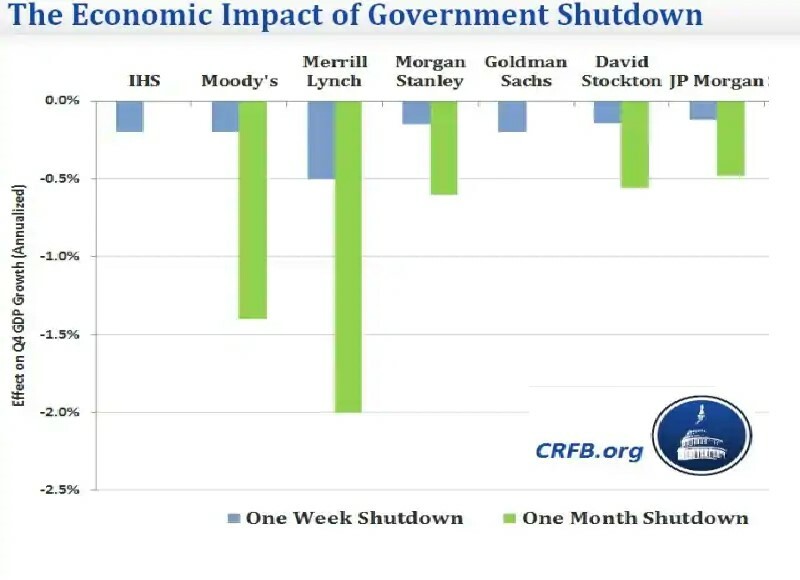 The White House’s own economists estimate that every week of shutdown reduces growth by 0.13 percentage point. Meaning, the economy has already taken a hit of at least 0.5%. Many economists are projecting U.S. economic growth of 2% this quarter, which is weak. But if the shutdown continues to drag into the spring months and beyond, some lower their expectations to 1.2% — or even ZERO — growth. If this shutdown continues to drag, my friend Phil won’t be the only one with empty hands. There will be plenty of suffering to go around. The stock market, meanwhile, has enjoyed a great, multi-week run even as the shutdown has dragged on. I guess Wall Street figures the shutdown will be sorted out … along with the trade and tariff war that the U.S. has with China. Oh, by the way, over the weekend, President Trump said reports of lifting Chinese trade “sanctions” were premature. Maybe the bulls on Wall Street are right. But if Wall Street is wrong, this market is set up for a heck of a reckoning. The mother of all haircuts. It will be severe. And I believe you’d be smart to get ready for it. P.S. The “mother of all shutdowns” is just one of six immediate threats to your stock portfolio. Watch my FREE video where Dr. Martin Weiss and I discuss those AND I reveal my No. 1 brand-new gold stock pick. Just turn up your speakers and click here to watch. Possibly Americans should buy AMERICAN MADE products! © 2019 Weiss Research, Inc. All rights reserved.